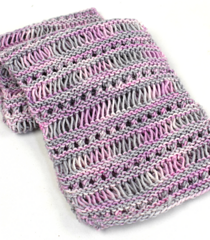 This is a perfect scarf for beginners or experienced knitters looking for a quick project. 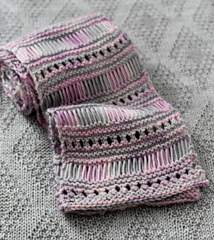 It’s very easy, but the stitch pattern looks sophisticated. 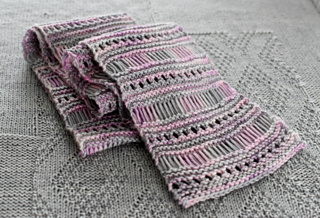 This pattern lends itself wonderfully to most yarns or combinations of yarns. It is written for DK or light worsted yarn, but is easily modified to accommodate any weight of yarn. See notes section on pattern. Instructions are written with full abbreviations. All measurements are given in US and metric. Please feel free to stop by my Ravelry group Polka Dot Sheep Publications for questions, comments, or to show off your Antonia’s Scarf. For subscriber-only news and offers, sign up for my email updates. Don’t forget to show us your work! Use #polkadotflock and @polkadotsheep on Instagram. Yarn: 210 yds. / 190 m DK or light worsted. 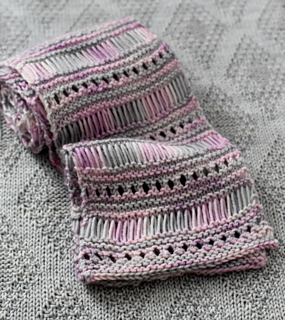 Shown in PDS Stumptown DK in Rose Quartz. Notions: Tape measure and a tapestry needle for weaving in ends.